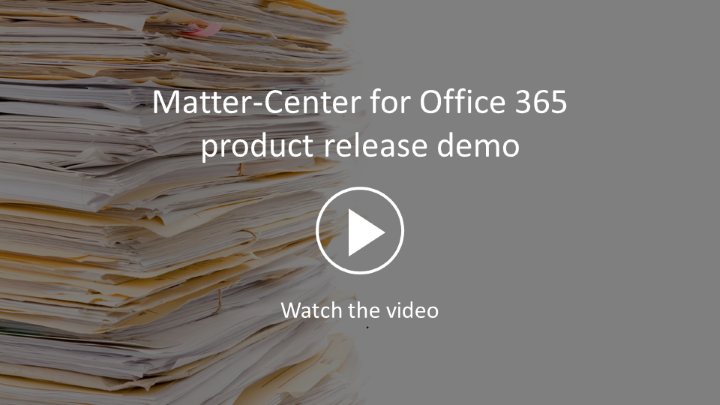 Matter-Center for Office 365 is an inexpensive cloud solution to help legal professionals manage documents and email in the context of clients and matters. With any device, when you want. The Microsoft Matter Center for Office 365 framework was developed by the Microsoft Corporate, External & Legal Affairs (CELA) group to provide a single view of all project-related email communications and document content, enabling secure information sharing with external parties. We have added a responsive interface that works on any device, with one click filing of all matter related documents and emails in a common location, visible to authorised team members. Version history management and threading ensures provenance is easy to identify and automatic metadata tagging makes the content findable to re-use. I use Office 365 without IT support. I need a solution to manage document and email history across a team, with any device from anywhere. It must be easier to use than a traditional IT document management system. We believe that business systems should be no more complex to use than buying stuff on Amazon or selling on eBay. We do this with no training, so why should legal document management be different ? 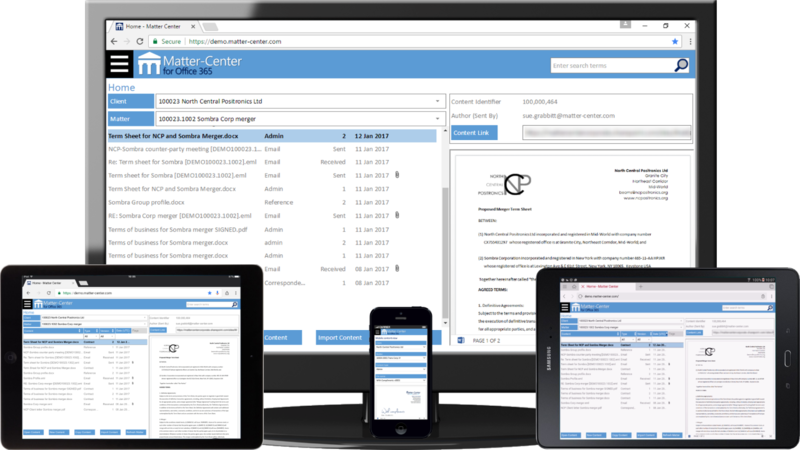 The Matter-Center journey and interface have been designed to simplify the document management experience, on any device, for intuitive productivity without training or manuals. Really. With a focus on people and process, law firms should not have to invest in owning and feeding low level technology platforms. Now that the IT industry offers credible utility platforms as public clouds, we can all enjoy better globalised economies of scale for cost and service. Matter-Center is built on Microsoft Office 365 for document storage and Microsoft Azure as the application platform. Replace paper client and matter files with electronic records, reducing print and storage costs whilst improving process efficiency with clear version and author provenance. Find and re-use existing internal IP to improve effectiveness of specialist practices that don’t rely on public precedents. View and mark up matter content anywhere with secured mobile devices, getting things done when you want. Manged external publishing and collaboration with clients to improve service, and control proliferation of material. The EU General Data Protection Regulation (GDPR) replaces EU Data Protection Directive 95/46/EC and UK Data Protection Act in May 2018. As the data controller, your law firm may have new compliance obligations that depend on a modern document and email management solution. We appreciate your interest in Matter-Center for Office 365, but are no longer providing the Matter-Center service direct to end users.